Orlando, Fla. — Golf Channel Films’ ’86, commemorating the 30-year anniversary of Jack Nicklaus’ historic 18th major championship victory at the 1986 Masters, will make its worldwide premiere on Golf Channel Tuesday at 9 p.m. ET. The one-hour special will tell the full story of Nicklaus’ remarkable come-from-behind victory to secure his record sixth Green Jacket. Highlighted by a final-round 65 and a 6-under-par 30 on the final nine holes, Nicklaus became the oldest winner of the Masters at age 46 and the second-oldest winner of any major championship in history. ’86 will feature interviews with Nicklaus, his wife, Barbara, sister Marilyn and oldest son, Jack II — who caddied for his father at the ’86 Masters. Additional interviews include members of the broadcast team in 1986, including play-by-play host Brent Musburger and tower announcer Verne Lundquist; fellow professionals Donnie Hammond, Tom Kite, Gary Koch, Curtis Strange, Sandy Lyle, and Bill Kratzert; and members of the media, volunteers and patrons who were on hand. • David Price and Sharon Price, Pittsburgh, Pa. — Price and his wife were watching the final round at home when his wife went into labor during Nicklaus’ surge on the second nine. Both avid Nicklaus fans, they watched his victory before heading to the hospital, where their daughter was born six hours later. • Ron Goldberg, Syosset, N.Y. — Goldberg and his wife were on their honeymoon in Hawaii. Ron spent the entire morning and early afternoon watching the final round in their hotel room, nearly missing their flight to Maui in order to watch the tournament’s conclusion. • Jeff Holman, Alpharetta, Ga. — A huge Nicklaus fan, Holman was in Germany playing professional soccer, and stayed up all night to watch the final round on German television, ultimately waking up his host family with screams to the television during Nicklaus’ final-round comeback. Bonus footage is online at GolfChannel.com/86. The video trailer is at Sneak Peak Video Trailer. ’86 is produced by Golf Channel Films, which has developed award-winning, critically acclaimed long-form documentaries and specials including the Emmy-nominated Payne; the three-part documentary Arnie and a follow-up fourth installment, Arnie & Me; and Ben Crenshaw: A Walk Through Augusta. 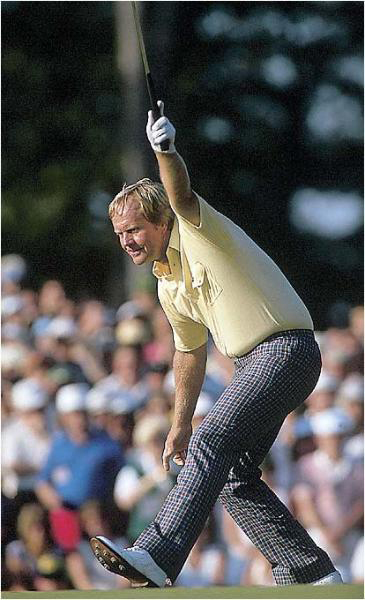 From 1959 to 2005, Nicklaus made 45 starts at the Masters, winning in 1963, 1965, 1966, 1972, 1975, and ’86. He also holds records for the most top-5, top-10, and top-25 finishes at Augusta National. Even 30 years removed from his final Masters victory, and more than 10 years after his final round at Augusta National, Nicklaus owns or is tied for no fewer than 35 Masters records.